After years in the Boston suburbs, the homeowners felt it was time to create their dream retirement home on Cape Cod. Their existing vacation property in Orleans provided a wonderful site, but the living space was burdened with significant issues. 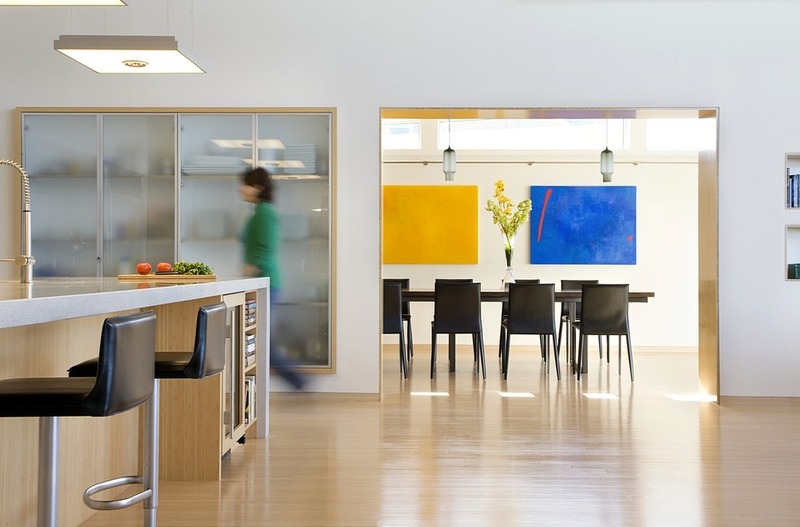 The decision to build a new contemporary home included the opportunity to capture ocean views from multiple rooms, plan the layout for improved functionality, solve all indoor air quality problems, greatly increase the thermal comfort, and provide a fresh, new aesthetic. SALTWATER LIVING. The new design offers open spaces that maximize water views and family living, including the open kitchen and breakfast nook, the living and dining areas, and the lower level family room. Oversized glass doors allow simple indoor/outdoor living and an appreciation of the water. The deck provides the connection and allows outdoor dining, paired with a three-season porch for sun and insect shelter. Above the porch, a roof deck offers second floor access to private outdoor space. Taking advantage of the sloping site, the lower level family room and boat storage area, designed to hold a small sail boat and rowing skulls, open directly to grade. ACCESSIBILITY. Planning for long-term accessibility was a priority for the homeowners. The first level includes a new garage with stairless entry into the house. Movement throughout is provided by accessible halls and doorways, adequate space around the kitchen island, throughout the living room, and in the master suite. The master bath is designed for wheelchair access, and includes a roll- or walk-in shower with seating. FUNCTIONALITY. The master suite also includes a private study as a convenient away room with a desk and television. For business activities, a dedicated separate office is located on the second level. After a day of outdoor play the master bathroom provides direct access from the exterior for showering for both the homeowners and their grandchildren. Similarly, when entering the garage, the mudroom offers immediate coat and shoe storage with convenient laundry in an adjacent space. Just beyond the mudroom, groceries can be off-loaded directly into the pantry area. AESTHETICS. 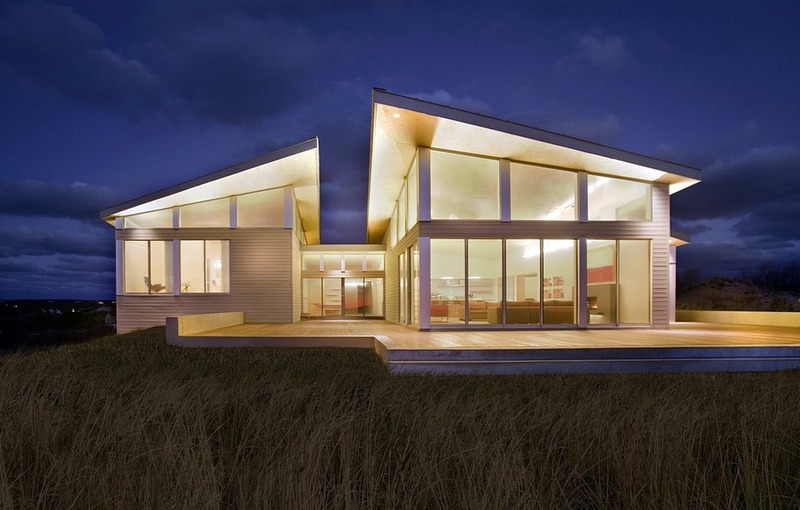 The contemporary design offers simple clean forms and rooflines, generous amounts of glass, and a waterside focus. Cedar shiplap siding and shingles clad the exterior, which will weather to a natural silver grey. A louvered pergola protects the front entry, shares lines with the standing seam metal roof, and is softened by the abutting living green roof above the garage. The interior living space is a combination natural wood floors and a warm wood paneled ceiling. Multiple wood-trimmed clearstory windows enable deep light penetration throughout the spaces.